During the 2012-13 academic year, Saint Joseph Regional High School completed an intensive self-study called “Excellence by Design” in preparation for a visit by representatives of the Middle States Association of Colleges and Schools. The Visiting Committee was on campus from November 11, 2013 through November 14, 2013, and submitted its final report, recommending full accreditation, on January 9, 2014. 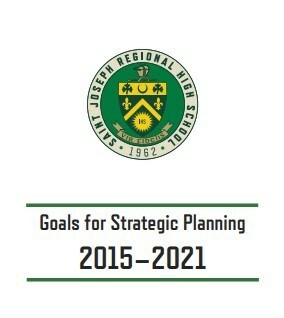 Aside from affirming the student performance objectives that were part of the “Excellence by Design” protocol, the Visiting Committee recommended in its report that Saint Joseph Regional High School develop a strategic plan that would carry the school through the period of accreditation (i.e. the 2020-21 academic year). Saint Joseph Regional High School had already formulated plans in specific areas of school life, especially facilities and, of course, technology, since a three year Technology Plan is a requirement of the Archdiocese of Newark. Additionally, the school’s leadership had a vision for growing the school academically and spiritually, and for cultivating the gifts and talents of its community even as it grew its enrollment. However, the school had not formalized a strategic initiative for its future. With that mind, the Board of Consultants and school administration identified the six key areas for planning (admissions, institutional advancement, academic programming, Catholic identity, technology and facilities) and assembled committees that included faculty, board members, alumni and parents. These committees then met several times during the fall of 2014; in January of 2015, the individual committees convened to hear the reports and recommendations of each of the six groups. Throughout 1 the spring of 2015, the Board of Consultants met to prioritize the recommendations, brainstorm methods of gathering the resources necessary to implement the recommendations, and finally to assemble a timeline for implementing the recommendations of each committee. The details of those recommendations follow.